Maria Motuznaya, a 23-year-old from the city of Barnaul in Siberia, came to public attention in late July, when she explained on Twitter, why she is on Russia's official list of extremists and terrorists. "Hi everyone, my name is Masha, I'm 23 years old and I'm an extremist," she wrote in Russian, introducing her story. In the 20 tweets that followed, Maria detailed how, in May the police accused her of "insulting people" by posting satirical memes on her profile page on VKontakte or VK, Russia's largest social media network. After an initial hearing, the case is returning to court on 28 August. Maria is facing up to six years in prison on charges of hate speech and offending religious believers' feelings - both criminal offences in Russia. "There were several memes - just some religious-themed pictures - that are about the Russian Orthodox Church in particular," she told me. One of the offending memes shows women dressed as nuns smoking cigarettes and urging each other to be quick "while God isn't looking". Another one features African children with empty plates in their hands, accompanied by a caption: "Black humour is like food - not everyone gets it". "There was no genocide or anything - simply some funny pictures," Maria explained. She says that the memes reflect her younger self and that she would not now post them today, as her outlook and sense of humour have changed. "I was 20 years old, a completely different person," she said. When Maria discovered that she was under police investigation, her first reaction was disbelief. "Honestly, the first time - when I was shown the [search] warrant - I laughed and asked: 'Are you serious?'. I thought it was a joke of some kind, maybe it's my friends playing a trick on me." She says that when she was taken in for questioning, the police told her she would be given "community service without a criminal record" if she signed a full confession. "I signed everything, having believed our great police," she told me, with a nervous giggle. "I can't believe that what is happening is real. It seems like any minute I will be told that I have been played, that it's all a joke," Maria added. But it is no joke. In fact, since her story made national headlines in Russia, it has emerged that in the same city as Maria, at least two more people are now facing potential prison terms on identical charges. Details of their cases are so similar to Maria's that it is hard not to get a sense of déjà vu: both used VKontakte, shared around a dozen memes there, and were later accused of extremism. One of them, Daniil Markin, 19, has been under investigation for more than a year. 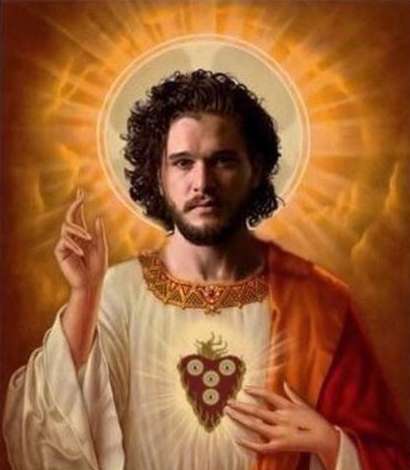 One of the images he shared included one that likened the popular Game of Thrones TV character Jon Snow to Jesus. "[It has been] a year since I started to be afraid to fall asleep, thinking that they are going to come for me in the morning," he wrote in a lengthy post on VK. "Russia is slowly, but surely killing me, as an undesirable citizen," he concluded. It has emerged that the investigations into both Daniil and Maria were prompted by complaints made to police by the same two female students. The women - who said their religious feelings had been insulted - have since deleted their social media accounts. Another defendant, Andrei Shasherin, 38, has been accused of extremism over memes satirising priests and Patriarch Kirill, the Patriarch of the Russian Orthodox Church. Police accused Andrei of "discrediting the leadership of the Russian Orthodox Church". In an interview with the independent Dozhd TV channel, Andrei said: "I did not want to go to prison, I was afraid of it, as I think anyone would be after a two hour talk with these guys. I signed a confession and a statement of sorts." Andrei has also been put on the Russian government's list of extremists. This designation places severe restrictions on how he is allowed to use a bank account. He can only withdraw a maximum of 10,000 roubles (about £117) a month. Some Russian media have sarcastically dubbed Barnaul the country's "extremism capital". But some commentators warn that the cases of Maria, Daniil and Andrei, are part of a national trend. Over the past few years, Russians have been increasingly prosecuted for their activity on social media, according to statistics released by international human rights group Agora. According to Agora, 411 criminal cases were brought against internet users in Russia in 2017. This compares to 298 cases in the previous year. Pavel Chikov, the head of Agora, said that because the official definition of "extremism" in Russian legislation is so broad, police can take issue with practically anything. This can range from the "politically incorrect" wording of someone's post, to online content that allegedly humiliates a certain religious, ethnic group or government officials, and even the police themselves. Indeed, in recent years Russian law-enforcers have found violations of the so-called "extremist" laws in all kinds of online content: from memes, reposts and historical photographs to composite images, comments and even "likes" for a particular post. According to Chikov, another reason why so much attention is paid to extremism in Russia is that for several years many government agencies have been tasked with locating and combating it. "Everyone has to fight extremism, everyone has to report about successful work," he explained. Ilya Varlamov, one of Russia's top bloggers, says at least one of the laws covering extremism - Article 282 on inciting hatred - was originally adopted "in order to give the authorities the pretext to persecute people for their beliefs". He believes it allows for authorities to have a "very free interpretation" of what breaks the law, so that it catches much of what anyone might do while communicating with others. He also blames the high number of criminal cases into online extremism in Russia on "the very poor quality of law-enforcement personnel, particularly in the regions". When I ask Maria who she blames for what has happened to her, she is adamant: "I think the justice system in general is to blame, the police and the entire way the system is organised". According to rights activists, the majority of cases into online "extremism" are launched over users' activity on VK, which they say actively cooperates with Russian police and security services. Chikov describes it as a "systemic problem", adding that VKontakte "always responds to" police enquiries "without a court order". VKontakte says that it is obliged by law to turn over information to the police. "We very carefully check whether each request has been correctly drawn up," the company told BBC Russian. It added that requests that "do not comply with the law are left unanswered". VKontakte said it will make changes to its policy and allow people to make their pages "fully private". The social network also told BBC Russian that in future it would make the statistics on law-enforcement requests public. In response to criticism, Russian internet giant Mail.ru Group, which owns VKontakte, called for an amnesty for those convicted over sharing or liking posts online. "The actions of the law-enforcement authorities often do not correspond with a potential threat and their reaction to comments or memes in a thread is gratuitously tough," it said in a statement. Despite the calls for amnesty, Varlamov says it is for now too early to talk about a "thaw". In his opinion, "there will be a thaw when no such cases are opened, when people are released from jail and when all complaints against them are withdrawn". Maria, who is facing up to six years in prison, is sceptical about her chances of acquittal: "In principle here in Russia the percentage of acquittals is at 0.2 per cent. I doubt I will be so lucky to be among those". However, if she is acquitted she plans to leave Russia. "I will try to get out of here, because there's no way I'm going to have a normal life here anymore."